Thank you for visiting Garage Experts of Dallas-Fort Worth. 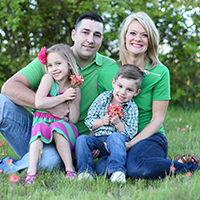 Local owners, Kris and Kelli Henthorn live in the Keller, TX area with their two young children, Kendall and Keaton. When you choose Garage Experts of the Dallas-Fort Worth, you are supporting a local small business in your community. By working directly with the local owners you can rest assured your satisfaction with the Industrial Strength Epoxy Concrete Floor Coating and Garage Cabinet installation is our number one concern. Garage Experts of Dallas-Fort Worth is currently installing garage floor coatings and custom storage solutions in and around Keller, Southlake, Flower Mound, Colleyville, Roanoke, Haslet, North Richland Hills, Fort Worth, and many more! Call Kris and Kelli today to learn more about how Garage Experts of North Fort Worth can help bring your vision for an ultimate garage makeover to life! Diamond badges are issued to those locations that rank highly in number of installations completed with high customer satisfaction. These locations represent the best 10% of GarageExperts locations, and the best of the best when it comes to quality garage renovations. When you’r;re choosing a Diamond GarageExperts location, you’r;re getting excellent service, support and products throughout your garage renovation. GarageExperts of Dallas-Fort Worth is your local garage makeover expert. View some of our recent work.